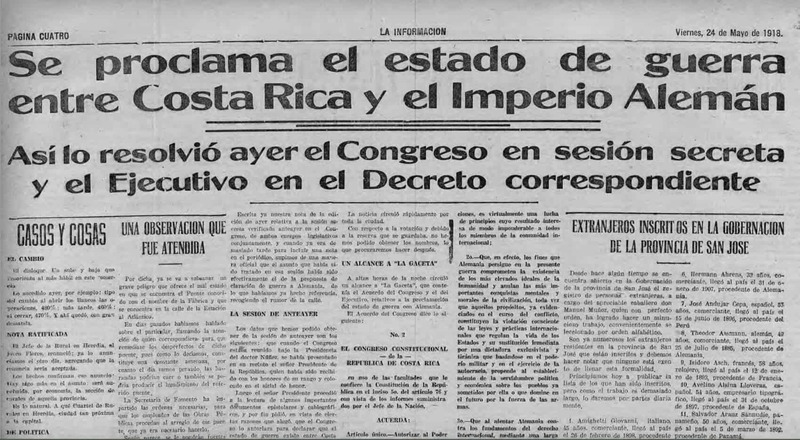 “State of war declared between Costa Rica and the German Empire,” read the headline – on page 4 – of the May 24, 1918 edition of the newspaper La Información. President Federico Tinoco broke formal relations with the German Empire on Sept. 21, 1917, but the declaration of war took almost another year, agreed to in a secret meeting between Tinoco and the Costa Rican legislature on May 23, 1918. But the declaration was a “total farce,” according to historian Patricia Vega with the University of Costa Rica. The Central American nation never sent troops or materiel to Europe and its war declaration was little more than a paper tiger. Vega said that General Tinoco — who rose to power in a coup d’état in 1917 — was desperate for the United States to recognize his government to gain access to loans and foreign investment for the country’s struggling economy. In the end, the support on paper was not enough to court the favor of U.S. President Woodrow Wilson. Despite a telegram from Vice President Thomas Marshall that congratulated Costa Rica on its “splendid stand for liberty” in joining the war effort, the U.S. never formally recognized the Tinoco government and barred Costa Rica from the Treaty of Versailles peace talks, according to the U.S. Senate Committee on Foreign Relations hearings on the treaty of peace with Germany. Costa Rica also fought alongside the Allies in World War II, when President Calderón Guardia declared war in December 1941. After the Civil War of 1948, President José María Figueres Ferrer abolished the Costa Rican armed forces on Dec. 1 of that year. Armistice Day was renamed Veterans Day in the U.S. in 1954.